(1) A Copy of Hayley’s Ballads (1805) bearing the familiar Blake plates but also containing a loosely inserted duplicate leaf of pages 109-10 in a variant setting. The variants are few and minor—“lo!” for “lo”, for example—but the existence of variants in the text has not hitherto been suspected. Perhaps there is an undetected re-issue of the work. Certainly the book survives in a large number of copies today. Under which Sir Philip Sydney is said to have composed his Arcadia. What Sydney’s fame protects and Sydney’s worth endears. The leaf is a mystery to me. For one thing, I do not know where it came from, beyond the fact that it was loosely inserted in a copy of Hayley’s Romney (1809) (which does have a genuine and integral Blake plate dated 1809) and given me by Mr. Manners of Blackwell’s. For another, though I have found a number of poems on the Penshurst Oak1↤ 1 Ben Jonson, “To Penshurst”; Edmund Waller, “At Pens-hurst” (addressed to Lady Dorothy Sidney, his Sacharessa); Francis Coventry, “Penshurst” (in A Collection of Poems in Six Volumes By Several Hands [ed. J. Dodsley] (1782), IV, 55-56—it is also in editions of 1755 and 1763. I have received generous advice concerning the poem, the engraving, Penshurst, and Sir Philip Sidney from Jean Bromley (University of Southampton), Dr. Felix Hull (Kent County Archivist), John Buxton (New College, Oxford), Viscount De L’Isle (Penshurst Place, Tonbridge, Kent), John Flower (The Yews, Penshurst), and Robert Essick (University of California, Riverside). (and even a representation of it2↤ 2 “Sir Philip Sidney’s Oak” is reproduced in Jacob George Strutt’s Silva Britannica (1822[-1825]), Plate XXVIII, along with poems by Jonson, Waller, and Charlotte Smith. (Sonnet XLVI “Written at Penshurst in Autumn 1788” in her Elegaic Sonnets ). 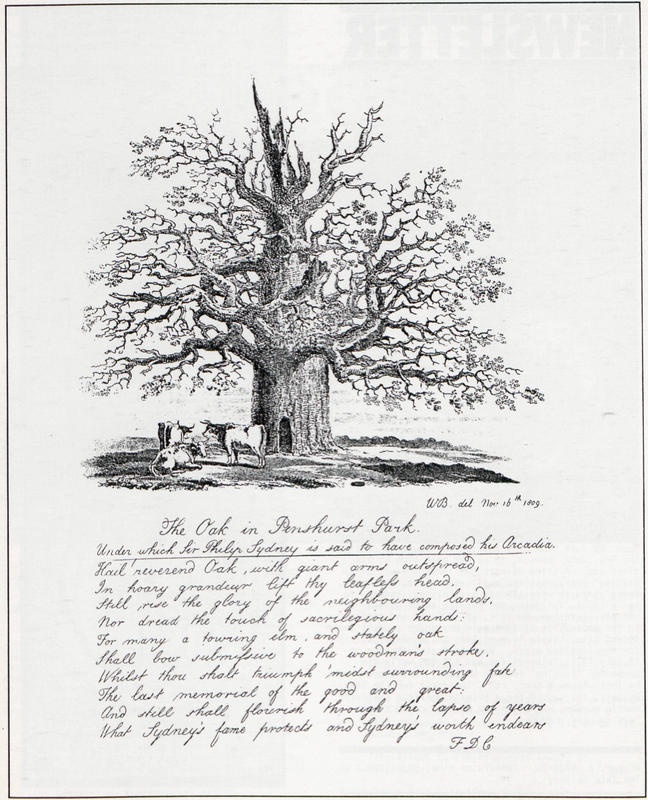 The tree was 25′ 11″ in girth on 27 September 1794 when Joseph Farington made a drawing of it (Farington, Diary, I , 243) and still stands today. ), I know of none by F. D. C. or containing these lines. The lines ought to be by Francis Coventry (d. ?1759), who did write a poem on Penshurst, but he did not have a middle initial beginning with D, and his Penshurst poem does not contain these lines. I suspect that it is by Frances Dorothy Cartwright (1780-1863), who signed the dedication to her Poems, Chiefly Devotional (1835) as “F. D. C.”—but this, apparently her only volume of poetry, does not contain the relevant poem, though it has others of 1802-1835. For another, though Blake lived in Sussex in 1800-1803, not so very far from Penshurst, Kent,3↤ 3 The great house at Penshurst burned down in 1793. and could have gone there, the design is not strikingly like his, and Professor Robert Essick thinks the signature and stipple work unlike Blake’s. There are very few tree-scapes by William Blake, and no cow-scapes at all.4↤ 4 There was a proposal in 1802 that Blake should engrave Mr. Spilsbury’s “drawing of Mrs Poyntz’s Prize Bull” (Blake Records , 100), but nothing came of it so far as is known today. In the 1820s Blake was rescued from the prospect of “making a set of Morland’s pig and ploughboy subjects” by commissions from Linnell[e] (ibid., p. 274). A number of other artists and engravers with the same initials were working at this time,5↤ 5 Samuel Redgrave, A Dictionary of Artists of the English School (1874) gives the following men working about 1809: Captain William Baillie (1723-1810), amateur etcher; William Barnard (1774-1849), engraver; William Whiston Barney (fl. c. 1810), engraver; Sir William Beechey (1753-1836), portrait painter; William Mineard Bennett[e] (1778-1858), miniaturist; William James Bennet (exhibited 1802-24), watercolorist; William Redmore Bigg (1755-1828), painter; Horace W. Billington (fl. 1802-12), landscape painter; William Bond, engraver; William Brockedon (1787-1854), painter; William Bromley (1769-1842), engraver; William Henry Brooke (1772-1860), painter; William Browne (1747-1825), engraver; William Burgess (1749-1812), painter; and William Burgess (1754-1813), engraver. and one of these may have been responsible. Probably William Blake’s proximity to Penshurst in 1800-1803, the identity of the initials on the engraving with his, the appropriateness of his profession, and the source of this copy of the print in a book with a Blake engraving of the same year are all just coincidences. It seems quite unlikely that the author of Songs of Innocence and of Experience had anything to do with the Penshurst Oak. This is a pity, for it would be agreeable to connect him thus with Sir Philip Sidney and with Percy Bysshe Shelley, to whose family the Penshurst property had passed by marriage.